Four-year ‘encuentro’ process begins in the U.S.
WASHINGTON (CNS) — In Spanish, the word “encuentro” means encounter and in the modern church in the U.S., it refers to a series of meetings that will take place over the next four years aimed at getting to know Latinos and producing more involvement in the church of its second largest and fastest growing community. “The intent is for Latinos to have an encounter with the entire church and for the church to have an encounter with Latinos, understanding who they are, how they think, how they live their faith, so we can work together and move together and build a church together,” said Mar Munoz-Visoso, executive director of the Secretariat of Cultural Diversity in the Church for the U.S. Conference of Catholic Bishops. A recent report by the Center for Applied Research in the Apostolate at Georgetown University commissioned by the U.S. bishops shows that more than half of millennial-generation Catholics born in 1982 or later are Hispanic or Latino. Those numbers alone call for the church to have a plan of how it will bring Latinos in the U.S. into the church’s leaderships roles, its vocations and their role in society, Munoz-Visoso said. While the numbers of Latinos in the church are growing, “there is a gap between the numbers of Latinos in the pews, and the numbers of Latinos in leadership, and the numbers of vocations, or (Latino students) in Catholic schools,” Munoz-Visoso said. The first part of encuentro, as the process is called, started in early 2017 and it’s the fifth such process of its kind. Encuentros in the U.S. church took place in 1972, 1977, 1985 and 2000, but the Fifth National Encuentro, also known as “V Encuentro,” is expected to be the biggest one of its kind in terms of attendance. Participants first meet in small Christian communities at the local level to discern, dialogue, reflect about faith and the baptismal call, Munoz-Visoso said. Later in the year, parishes will hold parish encuentros of their own, which will later lead to diocesan, regional and finally a nationwide encuentro, set for Sept. 20-23, 2018, in Grapevine, Texas, in the Diocese of Fort Worth. The final part is a “post-national encuentro” that will include publishing a national working document about ways to implement what was learned during the process. Encuentro organizers hope the process will yield an increase in vocations of Latinos to the priesthood, religious life, permanent diaconate, an increase in the percentage of Latino students enrolling at Catholic schools, and create a group of Latino leaders for the church, as well as an increase Latinos’ sense of belonging and stewardship in the U.S. church. Many Latinos are “joining the ranks of ‘nones,'” said Cardinal O’Malley, referring to the growing number of Americans who are choosing to be unaffiliated with any organized religion. “We have very few, relatively, Hispanics in our Catholic schools. They’re underrepresented in our religious education programs, and I’m hoping that the outreach that is going to be done as part of the preparation for this ‘encuentro’ will make a difference,” he said. Munoz-Visoso said Latinos are being courted by all kinds of groups, not just other church denominations. For those wanting to become involved, they can contact their local parish to see if the parish is involved in the process. More than 5,000 parishes have signed up to participate, said Munoz-Visoso. Parish-level encuentros take place this May and June. Diocesan encuentros will take place in the fall in more than 150 dioceses with a total of 200,000 participants. The regional encuentros are slated for March-June 2018, with 10,000 delegates expected to attend. The regions conform to the U.S. bishops’ 14 episcopal regions. 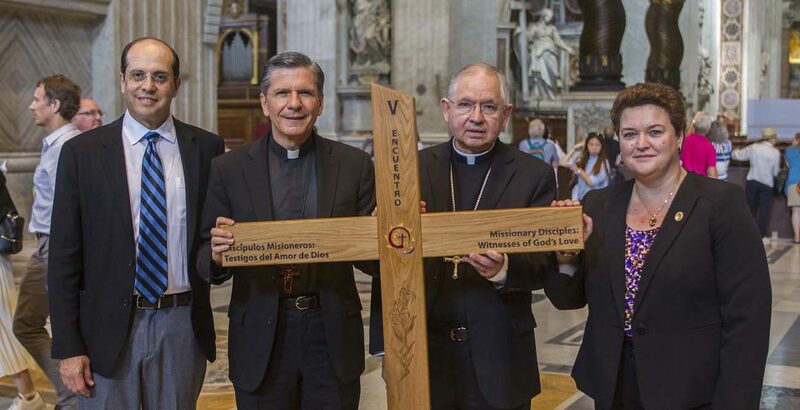 Then comes the Fifth National Encuentro in Texas, which will have as its theme “Missionary Disciples: Witnesses of God’s Love.” This is then followed by the post-encuentro working document. Alejandro Aquilera-Ttitus, assistant director of Hispanic affairs in the diversity secretariat, is national coordinator of the Fifth National Encuentro. The materials for the encuentro meetings were designed so they could be used by small and large groups, Munoz-Visoso told CNS, and there are dioceses that plan to use them with migrant workers in the fields, among prison populations, on university campuses, in prison ministry and in military services so that U.S. service men and women who want to participate can do so anywhere in the world. “The intent is for Latinos … but we’re inviting everybody (to participate), if they want to have it in their community,” Munoz-Visoso said, adding that the website www.vencuentro.org has information about getting started.